Sometimes in your life, you may have wondered why the filling is so large if the cavity wasn’t there just six months before and also not only one but a few ! The answer is that the cavity was there six months before — it just wasn’t big enough to show on x-rays, and it wasn’t visible to the dentist yet. 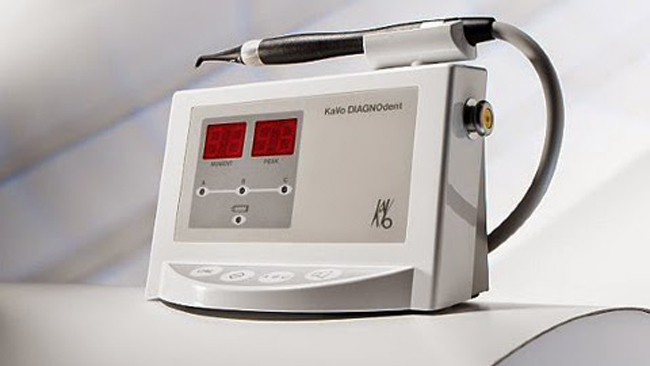 The greatest advance in dental diagnostics since the x-ray, the new Laser Decay Scanner can now find cavities years earlier, when the ultra-small cavity can be removed very comfortably via Waterlase MD (Decay remover), and repaired with a small invisible bonded filling. Diagnodent laser detection can catch problems before they begin! The Diagnodent device measures laser fluorescence within the tooth structure. As the incident laser light is propagated into the site, two-way hand-piece optics allows the unit to simultaneously quantify the reflected laser light energy. At the specific wavelength that the device operates (655 nm), clean healthy tooth structure exhibits little or no fluorescence, resulting in very low scale readings on the display. Carious tooth structure exhibits fluorescence, proportionate to the degree of caries, resulting in elevated scale readings on the display. Sharp explorer may not detect cavity. Diagnodent laser finds hidden cavities. A laser examination tool for the early detection of caries. Even very small lesions can be detected at the earliest stages. Earlier treatment – Filling last longer and less hassel!